For the vector, I decided to go with black outlines... At first the colors were based off the actual colors without the blue hue such as a black coat, green undershirt, etc.... But as I was making the background, I found that their colors did not go well with it. So I made a lot of adjustments to the colors, and it ended up being closer to the original scan. I redrew the small part of the coat that was cut off in the scan. ... After some help from animepaper on ideas for the background, I ended up working with a poorly done city scene. 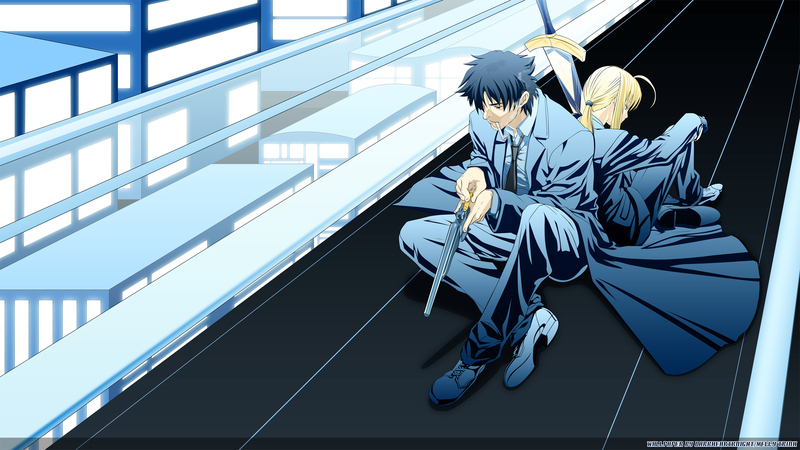 I don't recall how long it took, but I remember I was getting a bit tired of vectoring Kiritsugu and Saber... So I didn't get back to it until today. I contemplated on whether to paint the insides of the vector, but I decided to leave it all vectored. The background started off without outlines, then I felt Saber and Kiritsugu felt a bit out of place. I added a 3 pixel stroke around it. Changed shadow as advised by a critique in animepaper. I fixed misalignment of windows, since it irritated me after I realized it. This update hasn't really updated on minitokyo.... So it won't be noticeable yet. This wallpaper blew me away. I love how the colors are primarily blue complementing both of the protagonist demeanor/mood. The overall scenery reads like manual (my personal opinion). The background/atmosphere is brilliant, it's true to what you would see in the series. Quality is not lacking in any aspect of the wallpaper. Refreshing work! Awesome wall! I think the cityscape (almost like they're on a roof) really suits Kiritsugu.